Varsity WINS the 2018 Granite State Football League Championship! 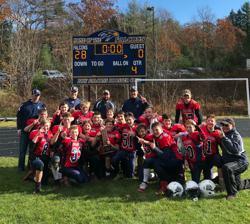 Congratulations to the Varsity Bow Bulldogs for winning the 2018 Granite State Football League Championship! Congrats to great Bulldog careers and best of luck in your high school careers! Please click on the Squadlocker link above to order new gear Bow Youth Football Gear online! For Bow Youth Football APPAREL - Click "Squad Locker" Link Above!!! Starting on Tuesday 8/27, practice weeks will be Tuesday through Friday for the remainder of the season for grades 7-8 and Tuesday through Thursday for grades 3-6. Start time never changes (always 5:30). We will shorten practice by 30 minutes at some point in September to end at 7:00 to accommodate school work. ©2019 Bow Youth Football / SportsEngine. All Rights Reserved.